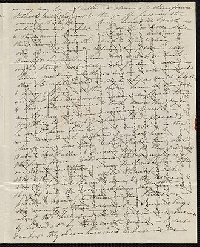 This is for those of us who have longed to receive and write a crossed letter, also called cross-hatching, like they did in Regency and Victorian England. Now we can all have a tiny piece of Austenland. What, pray tell, is a crossed letter? Paper and postage used to be really expensive (nice paper still is, actually, and postage is always increasing). To save money, letter writers would write on a page using all available space, then turn it 90 degrees and continue writing on top of what they just wrote. If they were really pinching pennies, they would write their third page on the same page by turning it 45 degrees instead of 90 degrees to write diagonally. But that might be too much for our modern sensibilities. Just think- it's environmentally-friendly! So! For this swap, please write a crossed letter to your swap partner of at least 2 pages (that is, 1 page, crossed at least once). PLEASE write legibly. Some people find it helps to use different colours when they change directions (if you do this, I'd recommend using the lighter colour first and crossing with the darker colour), or to double-space their lines, but this isn't a requirement and I tend to use only one colour myself. -Sealing wax is not a requirement, but just keep in mind if you do decide to use it that sealing wax often falls off modern paper in the modern postal system, so just prepare your letter accordingly so it will arrive to your partner safely. A crossed letter, sent on time, deserves a 5. I'm not requiring a rating minimum, but I reserve the right to weed out those with suspicious 1s.